What is PEP UP for Joy? You’ve heard of a random act of kindness, but how about a random act of cupcake? I can’t take any credit for this idea, but I had to share it because it’s so much fun to do. It’s very simple. Bring a cupcake to someone. Out of the blue, drop one off for them. Think of it like bringing someone flowers. Attach a card or note or a fork. If you are a baker, whip up a batch a deliver a few. Don’t bake? 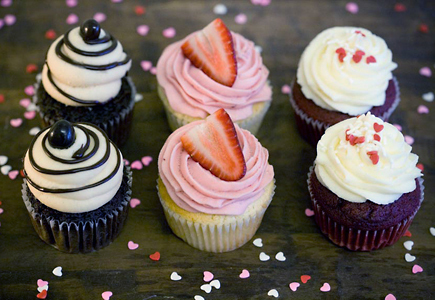 Most grocery stores have bakeries in them where cupcakes can be purchased. You can even splurge on a gourmet cupcake. There are cupcake bakeries popping up all over the place. They offer a scrumptious variety of treats where you can find one for that special individual you are thinking of. If you are in the Sioux Falls area, there’s an amazing little shop called Oh My Cupcakes! Actually, they can ship these cupcakes if you are not in Sioux Falls. These cupcakes are phenomenal and I have personally used them for my random act of cupcakes before. They get a very positive response. Flavor offerings include Triple Chocolate Meltdown, Cookie Monster, Rootbeer Float, S’mores, Peppermint Flip and more. Yum! This is a unique, creative and inexpensive way to show someone you care. It’s a sweet way to add some pep to your day. "Let us not give up meeting together, as some are in the habit of doing, but let us encourage one another - and all the more as you see the Day approaching"
"Your love has given me great joy and encouragement, because you brother, have refreshed the hearts of the saints." "May our Lord Jesus Christ himself and God our Father, who loved us and by his grace gave us eternal encouragement and good hope, encourage your hearts and strengthen you in every good deed and word"